Welcome to the wonderful world of TRX Organ Systems. We believe in putting you back in control of your music by converting your Yamaha Tyros, PSR-S970 and now the all new GENOS into an organ. Playing a single keyboard instrument is great fun and sounds brilliant but playing with two keyboards and pedals will unlock your creativity giving you total control and allowing you to play in real time without being tied to auto styles and bass. As single keyboard instruments became so popular and so good, Musiclands director Brian Reeve and manager David Harrild felt it would be lovely to have these same high quality sounds and styles on a 2 keyboard organ system. 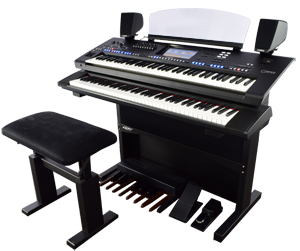 We found out there were no stands that allowed the two keyboards to sit neatly above each other without the top keyboard being too high or at strange angles and also no space to fit bass pedals, so TRX Organ Systems were developed. We would like you to meet our great team who's time and wealth of knowledge all put together creates the best sounding organ systems ever produced. From delivery and installation, on site help to expert and professorial programming of our superb software for your enjoyment. Brian started in the industry from the age of 16 selling guitars. He worked with some great organ players and watched and listened to them and tried to copy by ear. His shop Manager was STEVE LOWDELL who said " you must be able to play / demonstrate this lowery organ or you will be leaving tonight". If he had not done so he would not be able to play or have a business today. Musicland was formed in 1989 in partnership with Ray Spillman and some years later came the birth of TRX Organ Systems. At the age of 9, his parents bought him his first keyboard which was a Bontempi. After 1 year's tuition, he decided that he would throw away the teaching books and play by ear. David was inspired by his idol, Harry Stoneham, this encouraged him to form his Trio and became a familiar face with local Working Men's Clubs, Social Evenings and Dinner Dances. David is now known for performing at Music Festivals, Organ and Keyboard Clubs playing his TRX Organ System and is our TRX programmer and demonstrator. Rod started playing electronic organ at the age of seven years studying under the very capable guidance of John Norris (Principal of the Southern Music Training Centre Bromley) . While at School Rod also formed the first jazz band, and he won many major titles in the organ world. These include at 14 years of age Young Theatre Organist of the Year, at 18 and 19 years of age National Organist of the year and at 21 years of age Yamaha Electone Festival Winner. Now TRX player, demonstrator and programmer. Tom is the man who can !! Tom and his father Bob are responsible for delivering and installing your TRX Systems to your home, travelling the length and breadth of the UK and also recently France. Tom is also a very talented player and qualified piano tuner who looks after all Musicland's acoustic pianos and removals. Tom is the man who will look after you and instruct you on your new TRX System at the time of delivery making sure you are left smiling.